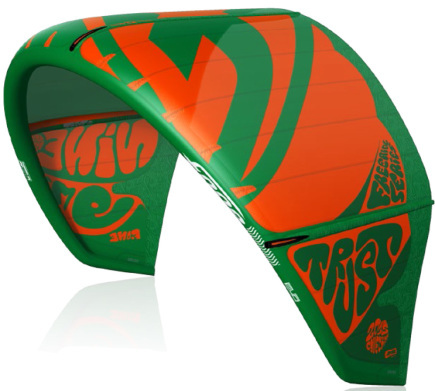 With an incredible speed control, the TRUST will make it easier for the riders to carve and dampen the waves and chop. Its exceptional upwind capabilities with flawless stability at 12 o’clock make it the perfect partner. The construction features a new fabric, the well known TECHNOFORCE™ double rip stop from TEIJIN. With superior resistance, robustness and more stability, this new fabric enables an unprecedented control of the canopy profiles. The 2015 TRUST also benefits from new reinforcements and a more balanced distribution of the tensions across the canopy fabric. One Pump valves have been further optimized. Thanks to the new fabric, it was possible to improve significantly the kite profiles with some neat gains in performances and ease of use. Remaining incredibly intuitive and stable to steer, with excellent power control and speed, the kite still demonstrates the best relaunch capacities. The 2015 TRUST makes it easier to ride underpowered without stalling the kite with power constantly available and easy to regulate. In the high range, the TRUST doesn’t pull laterally and can be eased progressively to head higher into the wind in complete comfort and making upwind riding as easy as it can get. The bar feeling is more pressed for a more expressive feedback of information which will help the less experienced riders. The TRUST is designed to fly with complete control any kind of wind conditions. Its behavior is reassuring and will give you full confidence to improve and push your level. Its Delta C Shape geometry, created and developed by F-ONE, remains the most acclaimed recent evolution to enable an easy relaunch. The AUTO RELAUNCH system will let the TRUST relaunch easily without requiring any complex procedure and will let you ride with full peace of mind. Diagonal webbings are located at the tip of the struts for more safety to avoid catching the lines. The kite can be neutralized easily when triggering the safety release as it will simply land on its back with no traction force thanks to the EVO bridle setup. The whole range has been redefined so as to offer a very consistent set of kites which all share the same qualities and feeling. There is no adaptation required from one size to another one. The 2015 TRUST is therefore a really high performing kite while remaining very accessible and easy to ride. With its very smooth and predictable behavior, it offers a uniquely intuitive steering. This kite will be the perfect ally to make the most of your sessions and enjoy some amazing sensations.